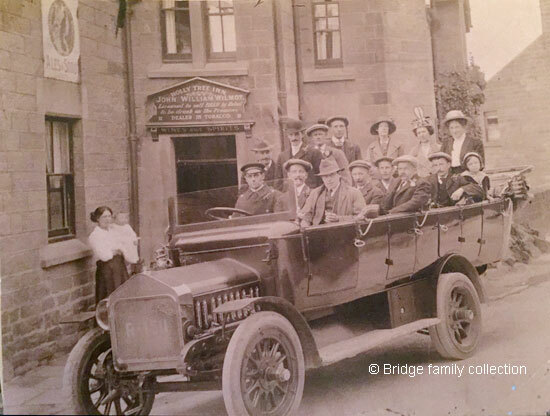 The charabanc standing outside the Holly Tree Inn has the Registration Number R 1511 and the vehicle could be a Napier owned by Hands of Matlock. The group were most probably locals as some of the faces crop up in other pictures within the site. It is possible they were going to a wedding as several of them are sporting buttonholes. The licensee of the Holly Tree at that time was John William Wilmot. His wife Elizabeth (nee Wood) and young child are standing beside the vehicle; the baby is likely to be Joyce L Wilmot who was born in 1914. John William, originally a builder/stonemason by trade, had taken over the licence from Tom Bridge. William Holmes had been the Inn's landlord for over thirty three years, from before 1881 until the licence was transferred to Tom Bridge at Matlock's Brewster Sessions in February 1913. Others who followed on included Mr. Joseph Frederick Downing and Edmund Holmes, who was the landlord in 1928. In the 1950s-1960s the Holly Tree was run (owned?) by John Eric Evans and his wife Dorothy (Allwood). They were still there in 1977. It is now a private house. Photograph of the Holly Tree Inn, about 1914. Photograph in the collection of and provided by and © the Bridge family of Canada. With thanks to Bob Morton and Barbara and Debbie, both nee Bridge, and to Dale (Bridge) Williams. See, for example, VLA4934 and VLA4960 taken outside the Three Horseshoes at Lea. John William Wilmot was shown in both the 1891 census and the 1901 census for Matlock. He was still living with his widowed stepmother on Osborne Terrace, Smedley St West in 1911. He married Elizabeth Wood at Derby St. Thomas later that year. By 1939 they were living on Edge Road and he was a Journeyman Builder. He passed away on 10 Feb 1985. "Belper News", 8 January 1937. Announcement of his death at his home, Spring Cottage, Hackney. "Kelly's Directory of Derbyshire", 1928. This information is from Bob Morton. Susan (Evans) Warner told him that she visited her many cousins there.